It's Friday again - are you ready to get your whoop whoop on?? Summer's winding to a close - can you believe that Labor Day is a week from this coming Monday? I'll be having surgery the day after Labor Day, so I've been trying to get as much quilting done as possible before then - I won't be able to quilt during September (recup' time) so I want to have some finished quilts on hand for the ministry. And since I need to do so much quilting, what do you think happened? Of course - I ran out of batting and it took about two weeks longer than usual to come in! 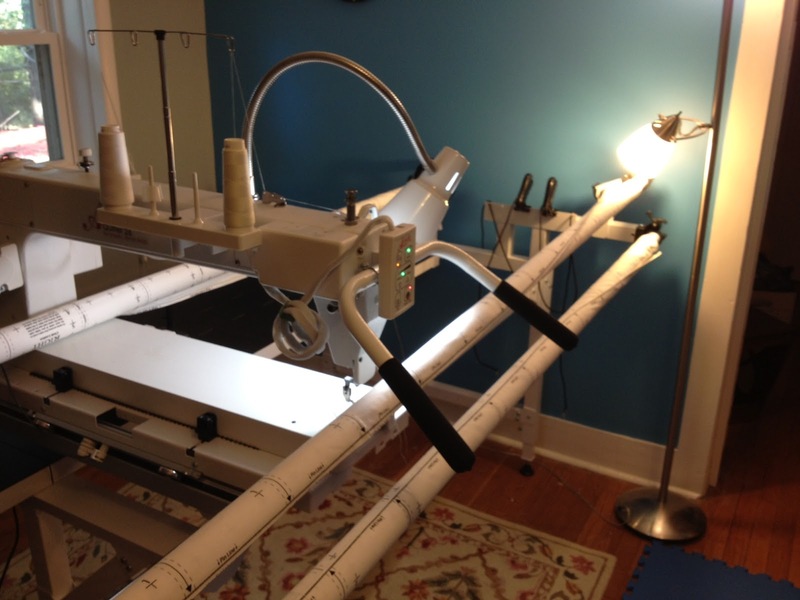 But it did come in today, and I went on a quilting marathon! No babysitting for me today - my daughter had the youngest granddaughter in tow - so Jolene and I had a day! Just in case you haven't met, this is Jolene!! I got up early this morning and, using the batts I pieced together from my batting scraps, quilted three quilts. Then I found a long but skinny piece of batting and quilted two narrow kids' quilts. Then I pieced another batt from scraps and quilted another top. Fortunately, just as I was finishing up that sixth quilt, my LQS owner called to tell me that my two rolls of batting had finally arrived!! So I jumped in the car, made a quick drive through Chez McD's on the way, and picked up the batting. ...the results of my quilting marathon! Ten lovely quilts all ready for someone else to bind!! (Well, sort of ready - I still need to trim them up, but that will get done tomorrow morning early!) It's amazing what you can do if you don't have a baby to play with take care of, and basically ignore everything else, including cooking supper. Kudos to my wonderful hubby, who saw what I had done and took me out to to eat!!! What a great guy!! Aren't they sweet? Lilli posed this picture for me - and had to include Bear in the pic! (He's the greyish-pink blob in the middle - Lilli's constant companion since she was Emmy's size!) My son-in-law says that Emmy has her "thug" look on - and I remember him describing a picture of Lilli just that way when she was little. It's so funny how much they resemble each other! There's no doubt they are sisters!! So now it's your turn!! We want to whoop with (and for) you!! we all want to see!! Linky party will stay open until Sunday night!! Isn't it great to be busy Sarah and you certainly have been. 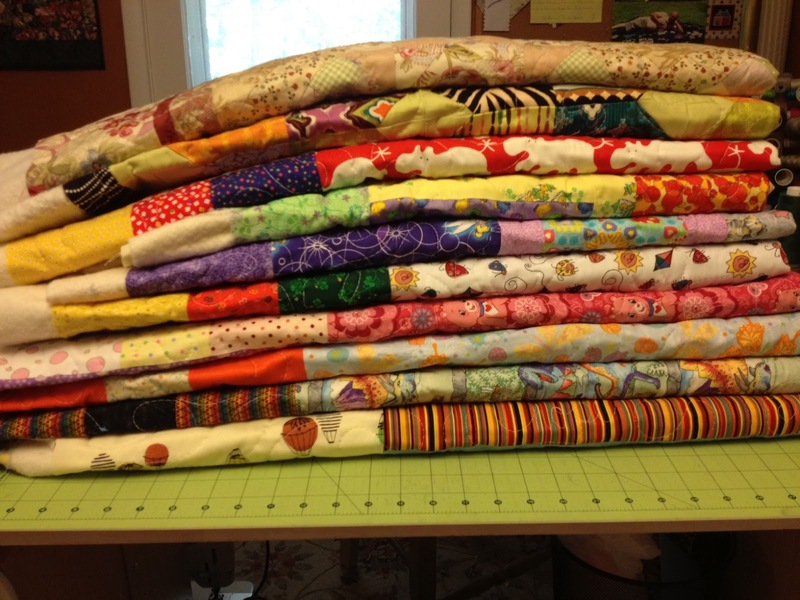 That's a lot of quilts to get through and a lot of binding to be sewn on! PS. I put my link up but think I messed up the image. oops! Batting! :D And WOW - what a pile of accomplishment! Very, very cool that your hubby took you out to celebrate. Oh my goodness, 10 quilts! That's a WHOOP WHOOP right there! Oh my goodness! I can't even imagine! I'm hand quilting my first quilt. Well, I tied one but that really doesn't count. But my gosh, 10?? I just can't imagine having one done.. much less 10!! WHOOOOOOP, WHOOOOP!! Wow! You are a speed demon! How did you quilt them? I would be lucky to get one loaded in the time you quilted all those! wow, that's impressive! best wishes for a speedy recovery. Funny, when I saw the pic of the grands, I thought, oh, the little one is none too pleased. Thug look, that's a good one-especially with that pinky hanging out. 10 quilts in 1 day...holey moley! Yay for a loving hubs & prayers for a good surgery/recovery. Congrats on getting so much done. Hope the surgery goes well. Wow! I'm amazed at how much you get done every week, but this takes the cake. whoop whoop! 10 quilts quilted, that's incredible! 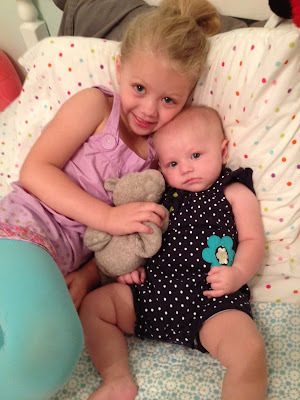 I had to work too much IRL, I didn't get anything done in my sewing world ;o) Love that picture of you grand-daughters! Wow! So many quilts done in such a short time. Well done! I wish I had that energy and pace. But oh well I'll get there. I wish you good luck on your surgery and I hope it all goes well and your back quilting in notime. Take care. Great Job -- And those babies are so cute!!! I love reading your blog and catching up with your many accomplishments. Take Care. I am amazed at all you finished - and you had not batt. Amazing what all those pieces can do for you. Speedy recovery and do take for you. You are one amazing lady! Whoop whoop! And I'm loving the thug look. Looks pretty great on that grandbaby of yours. Whoop, Whoop, Great job on all those quilts!!! I am excited to get back working on my projects.